We’ve teamed up with a fun group of bloggers to offer a GREAT giveaway with Cricut! 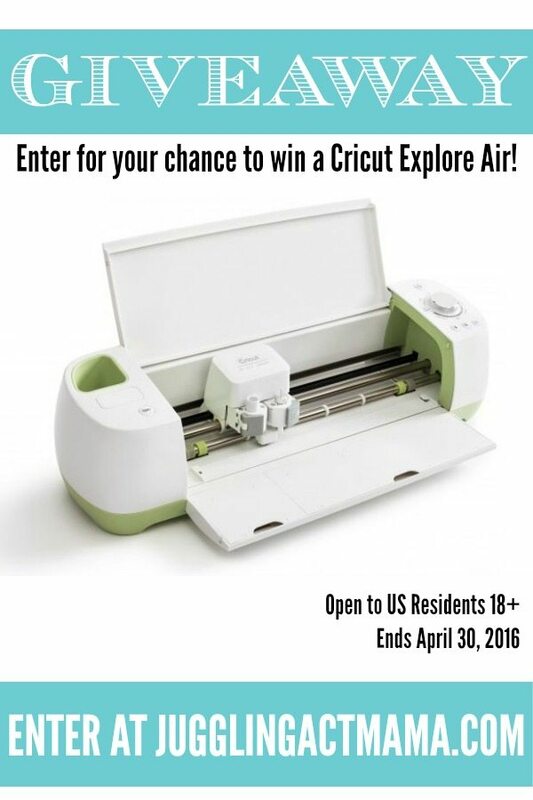 One lucky entrant will win this lovely, new Cricut Explore Air to cut and create to their heart’s desire. With summer right around the corner, I can think of tons of ways to use this new gadget… from pool party and backyard luau invites to graduation ceremonies and Fourth of July festivities, the creative possibilities are endless! The giveaway ends April 30th, so get your entries in while there’s still time. Scroll down for details! OFFICIAL RULES: Contest ends 4/30/16, 11:59pm EST. Open to US residents only. 1 winner will be chosen. Prize must be claimed within 48 hours of announcement or a new winner will be drawn. Prize is not redeemable for cash. Winner can choose $250 PayPal Cash, OR a the Cricut Explore Air. All entries will be verified. This giveaway is in no way associated with Facebook, Pinterest, Twitter, Instagram, Rafflecopter, Cricut or any other entity unless otherwise specified. Juggling Act Mama and participating bloggers not responsible for delivery of prize. Winner should allow 4+ weeks for delivery of prize. Follow Juggling Act Mama – Ang Paris’s board Cricut Projects on Pinterest. * This post contains affiliate links. Should you make a purchase through one of these links, Blogger Juggling Act Mama will earn a few cents.